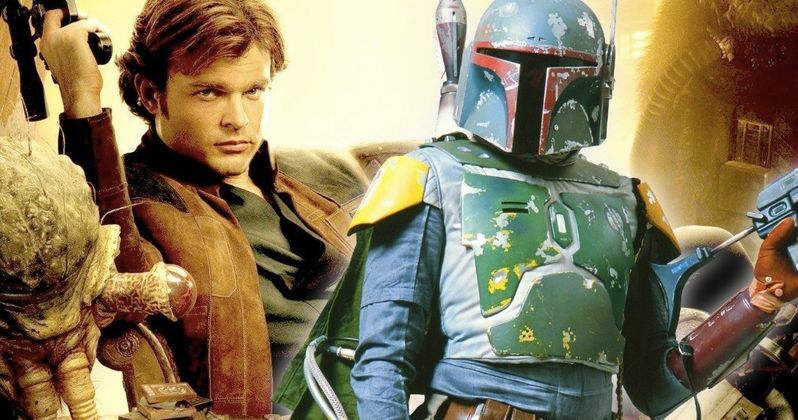 Alden Ehrenreich's Han Solo to Return in the Boba Fett Movie? Daniel Keys Moran, author of the 1996 Star Wars novel The Last One Standing, has confirmed that Lucasfilm has talked to him about possibly using his source material to make the Boba Fett movie. The Last One Standing is a short story that tells the tale of the fan-favorite bounty hunter through his perspective. However, there are also other passages that are written through the eyes of Han Solo, which has led many to speculate that Alden Ehrenreich's Han Solo will make an appearance in the standalone Boba Fett movie. In the mid 1990s, Daniel Keys Moran set out to write a story about Boba Fett that would feature his history with Han Solo. The story became The Last One Standing and it quickly became a favorite amongst Star Wars fans, though it has its critics as well. It appears that Lucasfilm has told Moran that they have intentions to incorporate his work into the Boba Fett movie. He had this to say. "I've had a guy at Disney email me a couple times over the years regarding Lucasfilm adapting Last One Standing into a Fett movie. Not asking permission, they own those works, just letting me know they were thinking about it. So that was kind. But after Solo stiffed, apparently there's some question about the Fett movie being made." It would seem that the young Alden Ehrenreich version of Han Solo would have to make an appearance in a movie about Boba Fett. Logan director James Mangold is currently attached to the project, but he has yet to confirm nor deny anything at the moment. But, it would seem highly logical to have Han and Boba Fett battle it out on the big screen in a story told through the perspective of the infamous bounty hunter. The Star Wars novels from the 1990s have been stricken from the official Star Wars canon, but The Last Man Standing could end up becoming a piece of the Boba Fett movie, which means that it would be recognized as canon again. Though the book may be used, it seems highly unlikely that Lucasfilm would solely adapt the story from Daniel Keys Moran's story. Instead, elements will be used, like the highly emotional and human pieces to Boba Fett's personality, which have been controversial for many Star Wars fans. If Daniel Keys Moran's The Last Man Standing ends up making it into the Boba Fett movie, it will make a lot of long-time Star Wars fans very happy. If Lucasfilm only takes elements from the story, it's still an excellent jumping off point for the bounty hunter's tale and could get Alden Ehrenreich back as Han Solo on the big screen. Even if he doesn't get another standalone Solo movie, Disney and Lucasfilm would still be putting the guy to work. Before Solo came out, many were worried about Alden's performance, believing he'd tank the film. But most agreed he actually pulled it off. So some fans will be happier than Ethan Van Sciver with a new Rose Tico toy to see him back on the screen as the old space pirate. There is still a lot of mystery surrounding the project, but Disney and Lucasfilm insist that it's still in development despite the box office stumble of Solo: A Star Wars Story. You can read more about what Daniel Keys Moran had to say about the Boba Fett movie at Star Wars Interviews.